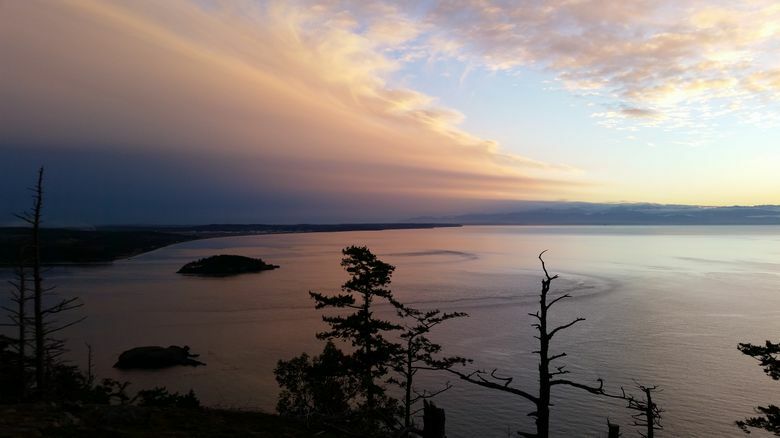 Sharpe Park gives eagle-eye views of Rosario Strait and the Strait of Juan de Fuca. FIDALGO ISLAND — It was blowing like stink, as old salts say. Perfect stormwatching weather, on a late-November day. I was near Deception Pass State Park, so aimed the car toward Rosario Beach. I was hoping for a close-up look at whitecapped rollers that were barreling in off the Strait of Juan de Fuca like a 100-car freight train bound for somewhere east of Sedro-Woolley. But, ack, the beach entry was gated. Little did I know, that part of the park is closed in these colder months. Serendipity possessed me to keep driving north on Rosario Road. Otherwise I’d never have discovered Sharpe Park, what Brian Adams, director of Skagit County Parks, calls a hidden gem: more than 110 acres of pristine second-growth forest and Fidalgo Island’s largest undeveloped shoreline, with wetlands and rocky balds threaded by a network of trails leading to soul-soothing views of the Olympics and the San Juan Islands. Q&A: Trendy CBD rocks retail world, but does it work? On this day of bluster and blow, it also offered neck-craning, eagle-eye views of vast expanses of wild water. Kathleen Sharpe deeded the original land for Sharpe Park in 1977 in memory of her husband, Wallace J. Sharpe, and his father, Thomas J. Sharpe, who were settlers on the property. Today, the park’s full name is Sharpe Park and Montgomery-Duban Headlands, the latter addition coming in 2004 when public and private dollars helped add more acreage and almost a mile of rocky shoreline edging Rosario Strait. Besides offering watery views, the park is a haven for birdwatchers. From a small parking lot, a wide and lightly graveled trail — thank you, Washington Trails Association volunteers — passes a picnic area and in a few hundred feet brings you to Fox Pond, a former beaver pond (presumably popular with some bushy-tailed fauna as well) that is gradually being filled in by cattails. A swooping kingfisher greeted me with its rat-a-tat chatter. Here’s also where to watch for wood ducks, whose males sport spectacular plumage, Machin says, noting that Anacortes High School science students have placed wood-duck boxes in trees around the pond. 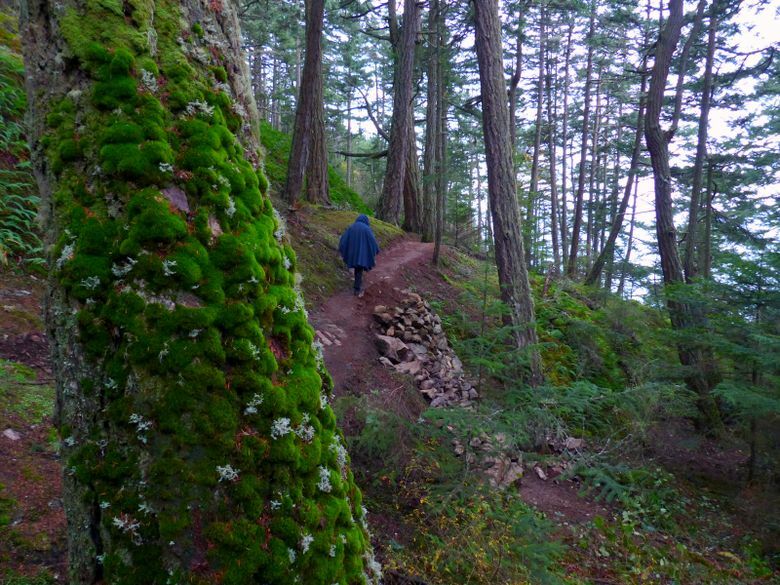 I followed the trail past nurse logs, sword ferns, salal and salmonberry under a canopy of Douglas fir, cedar, hemlock and alders toward Sares Head Viewpoint, the park’s highest vista. Be warned: Along with the whoosh of wind in the treetops I heard what locals call the “sound of freedom” from fighter jets on practice sorties out of nearby Whidbey Island Naval Air Station. On this stormy day I was able to mentally dismiss it as the rumble of distant thunder. At a fork in the trail, look carefully for tiny directional signs affixed high on an alder tree: left for Sharpe Park/Sares Head, right for Montgomery Duban Headlands/Rocky Bluff. I went left, and soon another fork gave the choice of an upper trail or lower trail to Sares Head; I randomly chose the lower trail, which later seemed a good choice upon discovering that part of the upper trail had become a streambed on this rainy day. The “chip, chip” of wrens from the underbrush accompanied me as the trail sloped gradually downward past a rocky mount thickly upholstered in small ferns. A few moss-coated, bigger firs, sometimes called “wolf trees,” towered overhead as the sloping forest opened to glimpses of the water. There was a bit of upping and downing until I found a viewpoint with a well-used bench atop a rocky bald dropping steeply to the water, far below. I rotated my head from right to left to take in the panorama, starting with the succession of receding-into-mist San Juan island hilltops, then the endless swells — white as snow drifts — marching across Rosario Strait, to the bulge of Watmough Head on Lopez Island, the gray smear of clouds allowing peekaboo views of the Olympics, the entry islets just off Deception Pass, and, finally, the distant runways of the airfield on Whidbey’s buffeted bluffs. Behind me, bleached-gray fir snags — of doubtless appeal to roosting eagles on calmer days — hung over a grove of madrona saplings struggling to stake a claim. Wind-pummeled, I didn’t stay long, but the view was worth it. The Sares Head walk is an easy 25-minute amble, just over a mile round-trip, with some moderate exertion. Other choices include several intersecting paths that can add up to a scenic 2.14-mile loop, including steeper terrain that takes you down closer to the water. Machin adds that, on foggy days, he has heard the eerie whoosh of whales spouting just offshore. Wait for spring and you might miss the storms but you’ll get another payoff as the rocky slopes burst with dainty wildflowers, including calypso orchids, chocolate, camas and fawn lilies, along with fairy slippers, shooting stars, yellow monkey flowers and coastal strawberry. Sharpe Park/Montgomery-Duban Headlands is at 14692 Rosario Road, south of Anacortes. From Highway 20, 0.7-mile north of the Deception Pass Bridge, turn west on Rosario Road. The park is on the left in 1.7 miles. No permits or fees required.